Michael was very professional in installing the loft ladder. He explained the options very nicely. Competitive price. When he finished the job everything was very neat and tidy. We are delighted with the work done to install our loft ladders. Very good worker, neat and tidy finishing on woodwork, would recommend to anyone. First class job!!! An excellent job. Polite, professional and tidy. I would have no hesitation recommending this company. Within a day of telephoning we had agreed Michael’s estimate which was very competitive. This installation was efficient and painless. No hesitation in recommending Access4Lofts. Service was terrific – efficient, tidy, finished ahead of schedule. Delighted! From initial contact to completion of work 100% customer service. Very impressed. Michael was helpful, professional and a tidy worker. Very impressed with all aspects of the work carried out. Professional, punctual, tidy and pleasant tradesman. The job itself was challenging and the outcome entirely satisfactory. Michael was very professional both at quote and fitting stage. He worked very hard on installation of the ladders and building loft legs and flooring. Great job and tidy too! Plywood Loft hatch & 3 section easy stow loft ladder. Michael arrived on time and did an excellent job fitting our loft ladder and new hatch door. Great price and very tidy worker. Would highly recommend Michael. At last I can use my loft! A professional, high standard experience. Great quality, good price! Reliable delivery. Michael was incredibly helpful and efficient. He took the time to explain our options and was very quick, professional and tidy when installing floor and ladder. Very tidy workers, putting sheets over the carpets and vacuuming at the end. The hatch is easy to open and I just love the ladders – it is brilliant not having to worry that they may topple over. Michael has done a brilliant job to put in a new ladder and hatch. I would like to recommend him to my friends and colleagues. Michael provided an excellent service. His quote was reasonable, he was very punctual and his work was of a high standard. I would definitely recommend. Delighted with a quality loft ladder. Very professionally fitted. Michael is polite and friendly and I would recommend this company without hesitation. Mrs E. McCarroll, Paisley, Glasgow. Michael and the service from Access4Lofts was exceptional. Great attention to detail and very much appreciated. Hi, I’m Michael and I am the owner of Access4Lofts Glasgow South. I am a loft ladder installation expert and I am ready to install a loft ladder to help you utilise your loft space. I can do this by providing a quality service and installation of a new loft ladder quickly, easily and affordable, giving loft access and storage solutions to suit your loft storage requirements. Not only can I install a loft ladder, I can also move your loft hatch or fit a brand new hatch, supply and fit loft boarding, insulate your loft to the latest standards, even install loft lighting and often in just 1 day – no mess, no fuss, just easy access to all that lovely storage space. As well as installing loft ladders, hatches, boarding and insulation in South Glasgow, I also cover the areas of: East Kilbride, Newton Mearns, Giffnock, Barrhead, Nitshill, Pollokshields, Pollokshaws, Newlands, Shawlands, Langside, Croftfoot, Clarkston, Busby, Carmunnock, Thornliebank, Pollok, Crookston, Cathcart, Neilston, Rutherglen. Paisley, Greenock, Largs, Port Glasgow, Hillington, Gourock, Lochwinnoch, Johnstone, Bishopton, Erskine, Kilmacolm, Bridge of Weir, Houston, Wemyss Bay, Inverkip, Kilbarchan, Linwood, Elderslie, Kilmarnock, Stewarton. I have also recently expanded to cover Blantyre, Hamilton, Larkhall, Stonehouse, Uddingston, Wishaw, Cleland, Motherwell, Holytown, Newarthill, Carfin, Shotts, Harthill, Cambuslang, Bellshill, Coatbridge, Wishaw, Newmains, Bothwell, Lanark, Carluke, Law, Shotts, Lesmahagow, Cleghorn, Strathaven. I offer a free quotation service with no high pressure sales and better still I don’t blind you with science or give you an approximate price and then add on extras – all my quotes are followed up in writing the very next day and I put a minimum of 5 year guarantee on all my work! And for extra peace of mind, I’m accredited by the Which? Trusted Trader scheme. 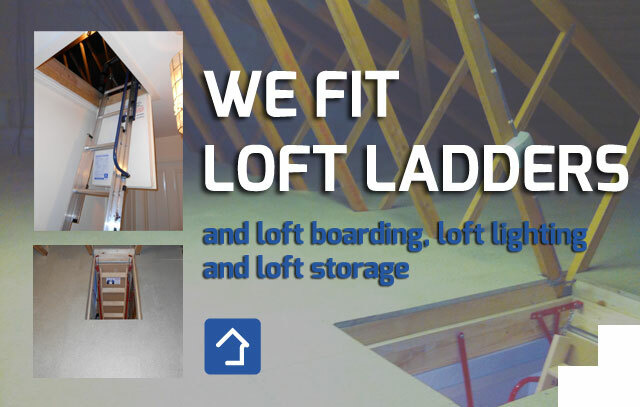 So if you are looking for a company to supply and fit a new loft ladder or wanting to make more use of your loft for storage, Access4Lofts Glasgow South is here to help. Please contact me on 0141 392 0630, or fill out my online quote enquiry form and I will happily arrange a convenient time to prepare a no obligation quotation.